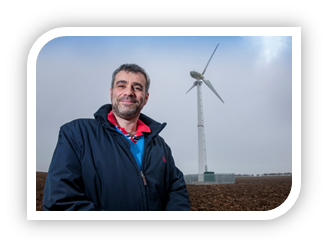 Earthmill stands head and shoulders above other wind turbine suppliers because of our comprehensive service and ability to handle to the entire project in-house from start to finish. Before we come out to do a physical site assessment, we can do a desktop assessment to ascertain whether you have a suitable site. Desktop site assessments are quick and carried out without charge or obligation by one of our in-house specialists. If you have a suitable site and would like to go ahead with the project, we will apply for planning permission, deal with any unexpected complications and carry out the installation. We will also coordinate your grid connection, registration for FiTs and conduct any necessary turbine maintenance and servicing. You will be appointed a personal project manager who will liaise with you and carry out the administration of your turbine project on your behalf, so you won’t speak to a different person every time you contact us. You can find out more about each aspect of the service Earthmill offers by looking through our services, starting here.